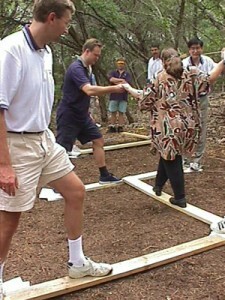 Team Craft provides two ROPES Challenge formats. These are activities that are based on the ground level activities found at a ROPES Challenge Course. Our adaptation of this approach is mobile and can be conducted indoors or outside. Overviews of the programs can be seen using the links below. The InterActive Teams format is for groups of fourteen or more and focuses on collaborative activities between two teams. The Team Initiatives program is for small groups with up to fourteen participants. In addition to the program overview, an additional page provides short descriptions and pictures of many of the activities that can be selected for inclusion in the program. The activities description page is accessible through a link on the program overview page for both Team Initiatives and InterActive Teams. We had a great time and lessons went learned. Feedback was all very positive. 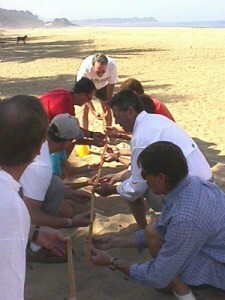 The activity helped different groups of people work together and meet, which was the purpose of the program. People will know each other better, as well as knowing people from different offices. Great job. Really pulled the team together. As a result of the program, everyone knows each other much better and is working on clear and effective communication across offices and products. This was a great activity to show the importance of team work. You did a great job as a facilitator.